As the days get brighter, you will notice dust and dirt more easily that went unnoticed during the darkness of winter. 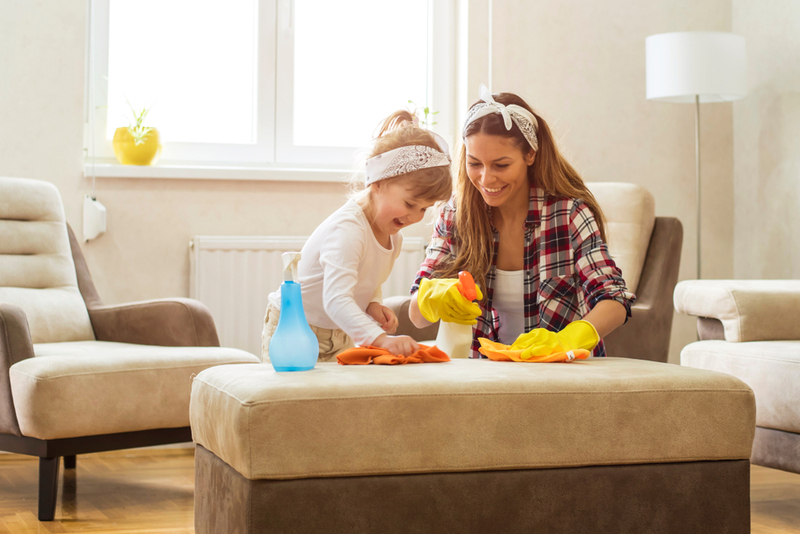 The long spring evenings are perfect to tidy up your home. Here are 10 tips and tricks to do spring cleaning right. Every six months or so, you should take some time to declutter your home. Gather any old, unwanted, or broken items, such as clothes, books, toys, furniture, etc. Sort everything into piles for recycling, charity, and storage. You will feel great after this therapeutic exercise and your home will certainly be looking tidier afterwards. Before you begin the dirty work, make sure you have all of the cleaning supplies that you will need. Essentials would include: strong rubber gloves, cloths, sponges, brushes, and bleach. They would also include: all-purpose cleaner, furniture and glass polish, as well as garbage bags and paper towels. Always clean from the ceiling to the floor by first tidying, then dusting along the ceiling, light fixtures, pictures, etc. That would be followed by vacuuming and mopping the floor when everything else in the room is done. The earlier steps will make your floor messy and you may also find that your work will seem easier and more productive if you finish either the downstairs or upstairs portion first before starting the other. The best time to take on this task would be right before you do your grocery shopping when the contents are at their lowest. Take everything out and dispose of any items that have passed their expiry date and almost empty items that you will probably never use. Wipe down the interior of the fridge with a damp cloth and disinfectant. You can defrost your freezer and then wipe it down with disinfectant too. Curtains and blinds are usually neglected in routine cleaning sessions but can collect a surprising amount of dust and dirt. Some curtains can be machine washed or dry cleaned; always check the care label and follow the instructions provided. Most vacuum cleaners come with a small nozzle with a short brush built-in that is ideal for vacuuming curtains and fabric blinds. Begin by removing all racks and placing them in a mixture of hot water and either oven cleaning solution or dish washing liquid. Allow them to soak while you clean the inside of the oven with oven cleaner. Always follow the manufacturer’s instructions when using oven cleaner, as it contains powerful chemicals. Scrubs the racks clean, rise, and dry. Make sure to clean off all cleaning chemicals from the oven walls and racks before using your oven again. Remove all bedding and use a vacuum cleaner to remove dust and hair that has accumulated over time. Spot clean any stains with a stain remover and damp cloth. Sprinkle a light layer of baking soda over the mattress and let it sit for a couple of hours. The soda will absorb any moisture and leave your mattress smelling fresh. Remove the baking soda with a thorough vacuum on the mattress. Every three months, flip your mattress to prolong its lifespan. Rugs can hold on to odours if not cleaned once or twice a year. Hang your rugs out on a washing line and use the handle of a sweeping brush on them. This will remove the bulk of the debris, dirt, and dust that gets embedded in the fabric. Take the rugs inside for a good vacuuming and apply a carpet shampoo to get them new again. Direct sunlight can dry windows too quickly and leave streaks behind. A cloudy day can keep the windows cleaner for longer, therefore, checking the forecast before cleaning windows is highly recommended. There are some jobs that you do not need to do yourself, such as window washing for top windows and chimney cleaning. If you want a thorough job done, you can always hire a specialist to reach those difficult corners that you cannot reach yourself with ease.